The Multnomah Historical Association isn't history. The past is still very much the present for Tim Lyman and Patty Ingebretsen, who manage the Association's business from offices on Multnomah Boulevard at SW 30th. Their latest effort is highlighting details of this area's history very publicly in Multnomah Village. Four historic buildings have been chosen to display metal markers which will tell the building's story and show how that building used to look. Those buildings are the current locations of Peachtree Gifts, The Vault (formerly O'Connors), John's Marketplace and Jeff Parker Realty. 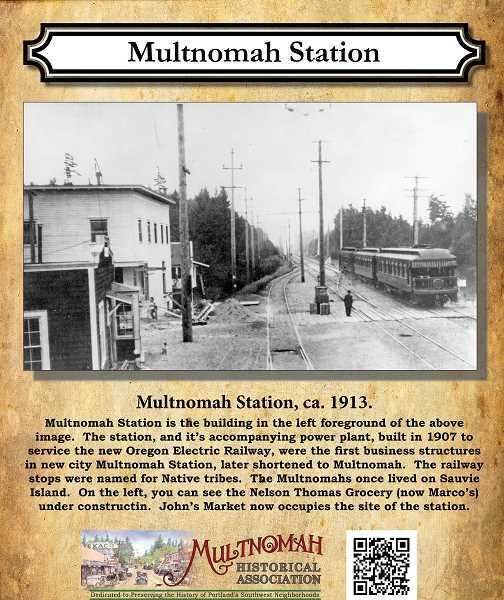 The Association's application for a grant from Southwest Neighbors Inc. (SWNI) to seed the historic display project was recently unanimously endorsed by the Multnomah Neighborhood Association's Board of Directors. Lyman and Ingebretsen would eventually like to spearhead an expansion of such a program to more historic buildings in and around Multnomah Village and ultimately to local homes of historic significance. But first there's the need to recruit new members. "We need volunteers. We need more people willing to do the work of preserving the history of Southwest Portland," said Ingebretsen. "We need volunteers and we need money. That's it right there," added Lyman. The Association dates back to 1978 when it set up shop in what was then the Multnomah School Building on SW Capitol Highway. Many of its early volunteer members were veterans of the successful effort to save the school building from being turned into a shopping mall in the late sixties. Ironically, the MHA couldn't afford the rent and had to move out of the building. That building is now the location of the Multnomah Arts Center. As for current membership, Ingebretsen says, "We've been more active and we've been less active and had more members and had less members. Right now we're kind of on the wane." She and Lyman obviously enjoy researching and talking about the history of the neighborhood. Get them going and you'll learn that Packy the elephant was the guest of honor at the opening of the Hillsdale Shopping Center, that Barbur World Foods was once a Piggly Wiggly and that Bertha Street is named after the daughter of the Red Electric Railroad Station at SW Vermont and SW Bertha. They're hoping that offering historic plaques for homes that are worhy of them will engage new volunteers and members. "Essentially what we're looking at is a photo of your home on metal along with historical details that could be mounted to the exterior of your house," Lyman said. "Of course this is provided we can research some history on the house. We don't want to just put up a plaque that says 'Historic House' if it's not." Ingebretsen says the research into the house's history can be rewarding but can also be difficult. "There aren't a lot of records because we were not inside the city limits of Portland out here. Multnomah County has some records, but not many. But we have our tricks for digging up the history for people who want to know more about the house they live in." Old family photos are a valuable resource for these local historians. "You might think that photograph of Uncle Henry in Multnomah Village is of no interest to anyone outside your family but you'd be surprised. That photo might show something in the background that fills in a missing hole in history," said Ingebretsen. "If you've got a picture of you as a teen ager working at an ice cream store in Hillsdale in the eighties that's still part of history." She adds that they will copy and return any photographs. Volunteers are also needed to conduct interviews for oral histories of SW Portland. "We want to combine people who have a story to tell with people who can do the interviews," said Lyman.